In 1979, founding PHW member and historian Ben Belchic passed away and left a bequest to PHW. (1) Knowing his interest in documentation of Winchester’s history, and his propensity to push others to do that research, the bequest was earmarked for a special project for the Revolving Fund. The opportunity to use that bequest came when a significant log duplex on South Loudoun Street was proposed for demolition as a parking lot. The Jennings Revolving Fund acquired the property at 422-424 South Loudoun Street to prevent its loss. It was apparent this property was a bit different from others that had passed through the fund. Although incredibly dilapidated after its use as apartments, the house held an architectural secret in its framing. 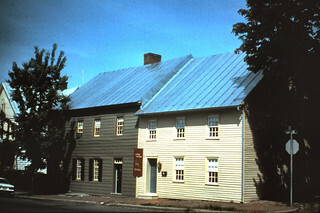 The older building at 424 S. Loudoun St., constructed by Godfrey Miller circa 1768-1777 (with remains of a smaller stone building circa 1750 incorporated into the log expansion) displayed an unusual construction technique for Winchester. The building was constructed with vertical corner post and plank, or post-and-plank log construction, a technique commonly associated with German settlers yet rarely observed in this area. Other buildings in Winchester may have this construction technique, though this is the only example documented in town. It is a feature impossible to observe from an exterior architectural survey because it lies solely within the bones of the house. In addition, tradition states that logs from Fort Loudoun were repurposed in the construction of this (and other) homes around town. Because of this unique construction technique and the fortuitous bequest from Ben Belchic, Douglass Reed was hired to lend his expertise in log construction to the documentation of the Godfrey Miller House. A short section was included on the younger (circa 1800) half of the duplex, the Peter Miller House at 422 S. Loudoun St., as well. This report is now available online to researchers: Godfrey and Peter Miller House Report. The Peter Miller House was purchased from the Revolving Fund by John G. Lewis. (2) That name may be very familiar to those who have been following along with the Friday posts. As an architectural historian, John Lewis documented the work he did and the history of his side of the house. This report is now also available to researchers online: Peter Miller House Report. These two homes have come a long way since their time as apartments in the mid-twentieth century. To see more of the evolution of the Godfrey and Peter Miller House, visit the Revolving Fund Flickr album.